The team sends its very best wishes to the Mars Exploration Rover team at NASA, whose second rover Opportunity has landed without a hitch on Mars this morning. 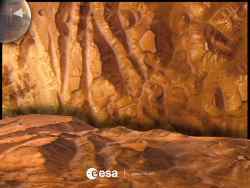 Although the Mars Express instruments are still undergoing calibration checks, the High Resolution Stereo Camera has already started sending back spectacular 3D colour pictures of the martian surface. As the media gathered to hear news of the first attempt to contact Beagle 2 via Mars Express, latecomers spilled out into the corridors of the packed briefing room demonstrating the continued public interest in the project. 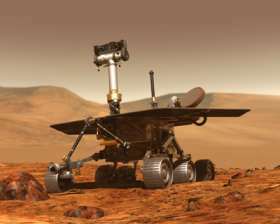 NASA’s Spirit rover successfully touched down on the surface of Mars early this morning. The first pictures from the onboard camera have been beamed back, the one below courtesy of NASA TV. 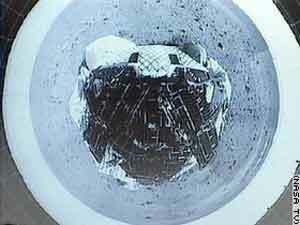 The Beagle 2 team wish NASA’s MER team all the best with the landing of the Spirit rover tomorrow morning GMT (8.35pm PST 3rd January 2004). 2003 has been a very busy year for the Beagle team and we are hoping that 2004 will be even more so!